Reza Sadeghi born 1979 in Bandar Abbas, Iran is an Iranian singer and songwriter. Sadeghi had been singing since his early childhood. He had an interest in music so he changed his way to the music. Reza belongs to the new generation of pop singers who emerged in post revolutionary Iran. He gained popularity among young Iranians. His most famous song is “Black is the color of love” (in Persian “Meshki rángeh eshgheh”). Reza has released several successful albums including “Black Shirt” , “World, Hold On” , “That’s It” , “Just listen”, etc. He has performed live concerts in different cities around Iran and in other countries. In 2015, concert tour in the USA made a huge success for him and his band. Now in 2017, Reza and big band of musicians come to Europe for the first time. 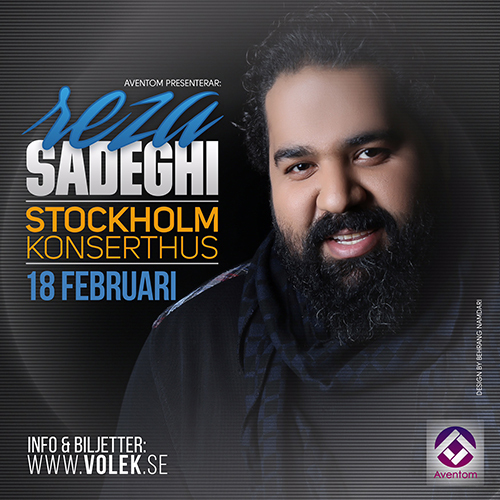 In Stockholm, the beautiful and classic venue of Konserthus is hosting him on 18th of February 2017.